Nokia is on the verge of finally officially lifting the cover off its camera superphone, the Nokia Lumia 1020 aka Nokia EOS, but interestingly another very interesting Nokia device has leaked out. It’s a scrapped product that never came into existence and never would - the Nokia Windows RT tablet. We have already seen images of the device leak out, but now another interesting piece of information comes up suggesting the RT tablet has been cancelled in favor of a full-blown Windows 8-based Nokia tablet. The information comes courtesy of anonymous sources speaking for The Verge. The original Nokia Windows RT tablet prototype is shown running on a Tegra 3 1.3GHz quad-core chip with 2GB of RAM, HDMI-OUT, USB Port, and SIM card slot. Of course, at this point in time it's unlikely for Nokia to release a Tegra 3 based device as newer and more powerful chips are available. The model name for the scrapped device is nVidia P1001. Funnily enough, the prototype allegedly ended up in the hands of a leakster as a gift from “someone who works at Nokia.” We can’t verify, but the images of the device definitely look credible. 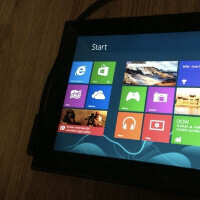 Good news remains that despite cancelling this particular tablet, Nokia is still working on a Windows 8 slate. Every single new Galaxy tabs and iPads im seeing have no Innovation either. Whichever section Nokia enters,it is going to dominant. No polycarbonate material on tablet please. Just use aluminum, just like lumia 925. 10 inch windows 8 pro would be great. Bring it on! Why they cancelled 10" Windows RT slate?